With help from the 2017 BioTreks Production Team. One of the most pressing concerns of the 21st century is the creation of clean energy to assist the increasing need for environmental conservation. Most of the motor gasoline sold in the United States contains 10% ethanol, which is typically fulfilled through the use of synthetic ethanol. The addition of ethanol to fossil fuels like gasoline helps generate higher octane levels in the fuel, maximizing fuel efficiency and resulting in reduced greenhouse gas emissions. Petroleum, the main component in synthetic ethanol, is extracted from depleting underground deposits and is a nonrenewable resource. Petroleum is not a reliable long-term solution to an increasing demand for affordable motor gasoline. Bioethanol has become a viable alternative as it is chemically indistinguishable from synthetic ethanol. Currently, bioethanol is made by fermenting large-crop plants like corn and sugarcane using Saccharomyces cerevisiae (also known as yeast). On average, bioethanol composes only 2.7% of the world’s transport fuel due to its high cost and tedious manufacturing process. Live organisms that undergo alcoholic fermentation are the more profitable vehicle of production, but most single-celled organisms cannot break down large polymers of sugar into the monomer glucose. Consequently, they are unable to ferment stored plant sugars into ethanol. This project’s goal was to create a synthetic system in yeast that directly breaks down starch into glucose so that alcoholic fermentation can occur with a larger range of reactants in a single pipeline. The system bypassed artificial methods of bioethanol production by adding hydrolytic alpha-amylase to yeast in order to promote the breakdown of starch into maltose, then further upregulating the maltase gene to maximize glucose output. This method avoids the inefficiencies of current bioethanol production, opening the door to bioethanol being a reliable substitute for conventional fuels. Authors are listed in alphabetical order. Emily Miller mentored the group. Please direct all correspondence to emiller@westwood.k12.ma.us. This is an Open Access article, which was copyrighted by the authors and published by BioTreks in 2017. It is distributed under the terms of the Creative Commons Attribution License, which permits non-commercial re-use, distribution, and reproduction in any medium, provided the original work is properly cited. Ninety percent of bioethanol is created using a dry milling process where grain is first crushed into meal and added to water. Enzymes are then added to the mixture to break starch down into simple sugars. Yeast is then added in to allow fermentation to occur, resulting in a process that takes around six days (de Oliveira et al., 1986). Three of these days consist of yeast preparation in order to make it a viable actor in fermentation. If a system could reduce the time needed for the initial process to occur, a substantial amount of ethanol could be produced within a shorter amount of time. 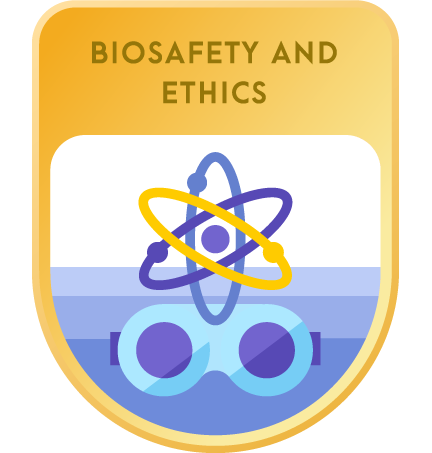 For example, if the initial step, yeast preparation, were done in half the time, there would be a 25% reduction in the overall production time—a considerable difference that could make bioethanol a more consumer-friendly and environmentally beneficial resource. When it comes to gasoline, functionality, cost and origin are all important factors of consumer interest. While some might advocate for cleaner gasoline that avoids toxic byproducts, others may find that the performance and price of the fuel is more impactful. In order to redirect consumer traffic away from traditional gasoline, new fuels must be better (e.g. greater energy density in kilojoules per gram) and cheaper (Park et al., 2010). A new system that would expedite the creation of bioethanol would not fulfill the need for superior fuel, as bioethanol is essentially identical to synthetic ethanol. However, cheaper bioethanol with greater production would bring bioethanol to the same efficiency and cost standard as its synthetic alternative. With equal levels in productivity and price, there is nothing stopping the renewable, more eco-friendly option from gaining the popular vote. So why hasn’t a new system for bioethanol surfaced? While scientists have been working to transition to a low-carbon economy, we can ensure efficient fuel with a renewable source using biological engineering. The process leading to fermentation has been ameliorated; however, some of the best machinery that nature has to offer has not been properly utilized. Yeast, a great natural fermenting agent, can be manipulated to work on a number of tasks all at once. The work that is done by crushing the grain in order to extract simple sugars can easily be done by modified yeast programmed to secrete the enzyme alpha-amylase. 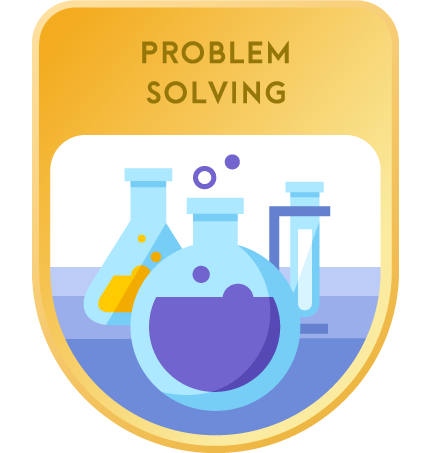 This system aims to fully harness the multifunctionality of yeast in order to simplify a complex and inefficient process. Because the glucose of the system is created entirely from carbon fixation in plants, the carbon dioxide output when burning ethanol essentially recycles the same CO2 back into the air, whereas traditional fossil fuels disrupt the Earth’s natural CO2 levels (Ekino et al., 2002). Ethanol does not necessitate the use of costly machinery, as a simple sieve dehydration process will separate ethanol from the other products that yeast naturally creates. Although certain bacteria also use alcoholic fermentation, yeast at 20℃ produces 20% more ethanol than bacteria at the same temperature (Russell et al., 1981). 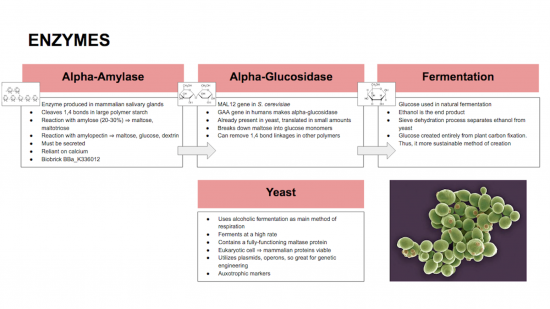 Given that yeast already contains a maltase gene and uses alcoholic fermentation as its primary pathway for cellular respiration, yeast was the ideal chassis. A wide range of mammalian proteins are compatible with yeast, as it is a eukaryotic cell. It also utilizes plasmids and the operon system, making it a perfect candidate for genetic manipulation (Ekino et al., 2002). Yeast plasmids contain an auxotrophic factor that allows us to test for the presence of the transformed plasmid. Growing the yeast in a histamine or leucine-deprived medium would allow us to grow only yeast that contains the his or leu factor, acting as a selectable marker for transformation. 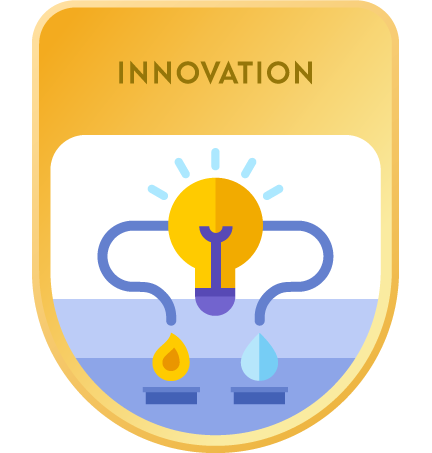 Yeast would also work as a great tool for fermentation as a concentration of 106 yeast cells per cc causes a fermentation rate of 0.62 cm per hour, therefore fulfilling our main goal (Park et al., 2010). Natural ability paired with versatility makes yeast the perfect agent for our purposes. Starch is composed of alpha-glucose molecules with the majority of bonds being 1,4 linkages. The enzymes used in the system target these 1,4 linkages, leaving only a few molecules dimerized. First, the enzyme alpha-amylase cleaves the starch polymer into the disaccharide maltose. Then, the enzyme maltase breaks down the disaccharide into individual glucose molecules (see Figure 1). These alpha-glucose molecules are naturally used in fermentation, the end product being ethanol. The DNA for the system will be transformed into the yeast with two plasmids, each with strong, differing promoters. One plasmid will have the gene for leucine and the other for histamine, acting as auxotrophic selection markers. Plasmids will contain a yeast centromeric origin of replication (ORI), which will allow the DNA to become permanently integrated as a chromosome into the cell line’s genome. Two plasmids will be used so that the yeast would not be overwhelmed by a single plasmid containing three new genes. Figure 1. The starch to ethanol system utilizing the alpha-amylase, alpha-glycosidase, and yeast organism. Alpha-amylase, or salivary amylase, is an enzyme produced in mammalian salivary glands that breaks down large alpha-monomer polysaccharides such as starch. 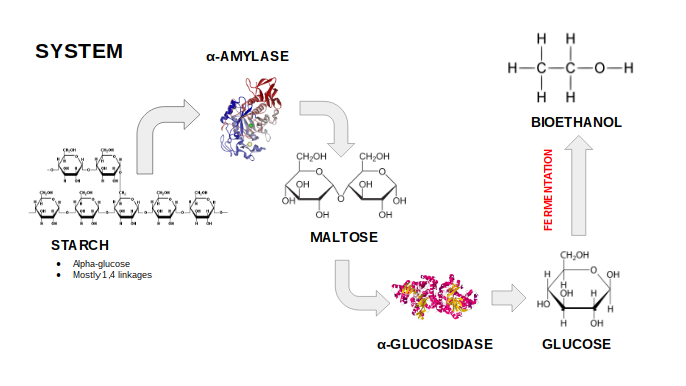 The reaction of amylose (which makes up 20-30% of starch) with alpha-amylase produces both maltose and maltotriose. When amylopectin, the remaining starch molecule, reacts with alpha-amylase, the end products are maltose, glucose and dextrin molecules. This reaction works at a neutral pH, which is ideal for a yeast chassis. Starch molecules are too large to enter through the yeast membrane, meaning alpha-glucosidase (functionally equivalent to maltase) has to work outside of the cell. Amylase is naturally secreted by yeast through the use of lysozymes outside of the cell, where it is activated by water. This enzyme must be secreted since starch is too large to enter the yeast cell via channel proteins. This amylase gene, which is not naturally present in yeast, must be inserted with a plasmid. BioBrick BBa_K336012 from the Registry of Parts contains the eukaryotic gene sequence for salivary amylase which can be easily integrated into the yeast cell. The goal of the system was to simplify. With this added device, starch-based crops can be inserted into the system with almost no preparation, therefore effectively reducing the equipment and time needed for fuel creation. The yeast gene MAL12 creates the protein maltase. This enzyme cleaves the disaccharide maltose into individual glucose molecules. Because of this, it is also speculated to be able to remove the remaining 1,4-bonded glucose monomers in maltotriose and dextrins. The alpha-glucose molecules that remain are naturally used in fermentation. MAL12 is naturally found in yeast; however, it is only activated in small amounts when there is a lack of glucose in the environment. A strong promoter called GAPDH will be added in order to amplify the maltase enzyme’s effectiveness (see Figure 2). The speed at which a chain of sugars can be broken down is dependent on the amount of enzymes ready to break it down. Until the yeast’s threshold fermentation rate is reached, the faster the glucose is supplied, the faster the ethanol is created. Figure 2. Description of devices used in system. To create the system, we will transform yeast with two different plasmids. Both of these plasmids have centromeric ORIs for yeast, allowing them to replicate like independent chromosomes. This format is ideal for breeding a strain in large numbers. The plasmid that will be used for the alpha-amylase enzyme is yeast plasmid pRS413, which contains the auxotrophic factor HIS3, or L-histidine. 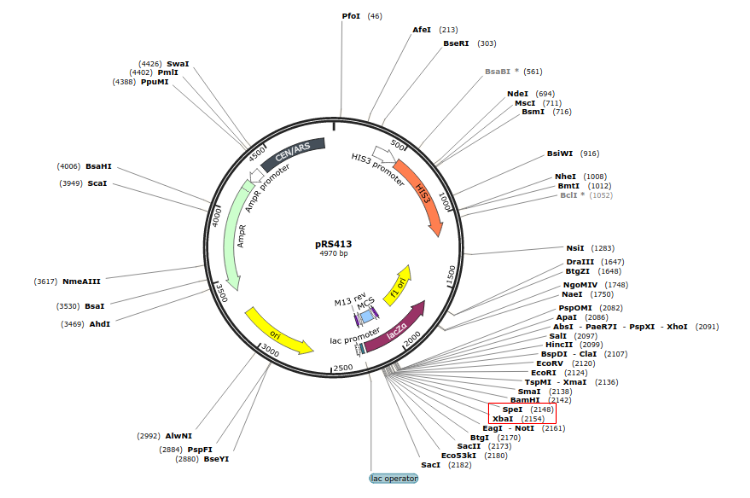 A second plasmid, pRS415, containing the MAL12 gene and a leucine auxotrophic factor would code for maltase. Yeast requires both histamine and leucine, meaning that both plasmids are necessary for the yeast’s survival. BioBrick BBa_K336012 contains the gene sequence for making alpha-amylase, which will be used in transformation; it has an XbaI restriction site in its prefix, and a SpeI restriction site in its suffix, neither of which occur in the gene itself (see Figure 3 and 4). In the plasmid, these sites occur in the order of transcription; accordingly, they will fit the alpha-amylase gene. The gene will be located in the lac operator, preceded by the lac promoter and lac repressor. The location of the genes will inhibit the yeast from creating a white protein which would act as a green fluorescent protein (GFP). A white protein in the culture would indicate that the specific genes were not added to the plasmids. 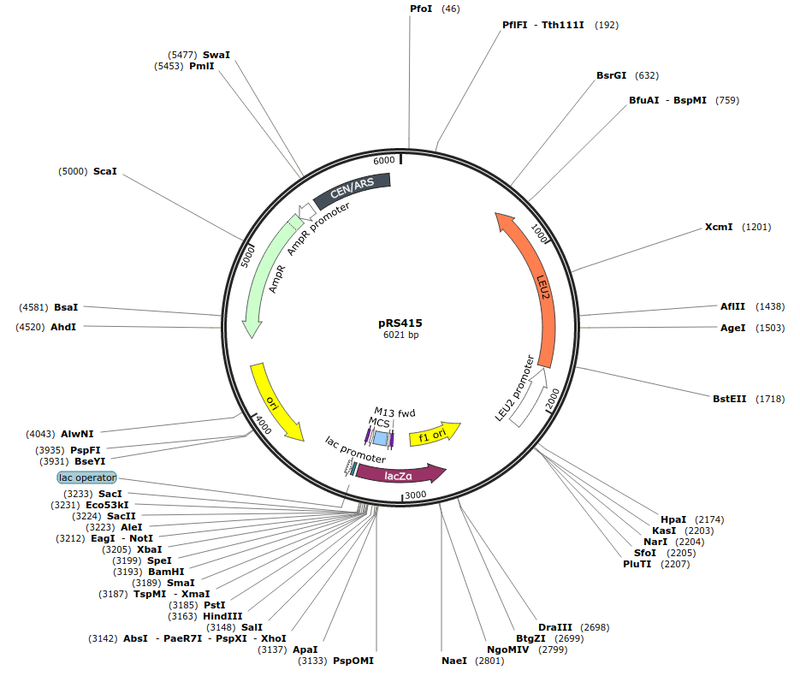 Figure 4. pRS415 plasmid and highlighted restriction sites (NotI and BamHI). A bioreactor will be used to pump fresh medium into the yeast culture and waste products out. Those participating in the testing will take caution when handling the substances used. Testers will be especially careful when handling ethanol as it can irritate skin and eyes. Wearing goggles, lab coats and gloves will be necessary for testing. Ethanol is intoxicating if consumed and will have negative effects on cognitive and metabolic function. Additionally, ethanol is highly flammable and should not be handled anywhere near a source of ignition. Flames and objects that create sparks from friction or electricity must be kept away from the testing facility. As the world begins to realize the long-lasting effects of fossil fuels, alternative methods of energy must be embraced. Bioethanol will be one of these methods, as it does not produce toxic byproducts. This system will have the same byproducts as traditional means of bioethanol creation with the addition of a few non-toxic components such as lactose and alpha-amylase. Byproducts of synthetic ethanol production such as methanol, acetaldehyde, polythene and ethoxyethane threaten communities as they are poisonous and will infect large swaths of land should they be disposed of incorrectly. A yeast-based system provides a safe method of mass ethanol production that has little impact on the environment. Additionally, the need for ethanol will only increase. In 2016, Americans used over 143 billion gallons of motor fuel, a record amount that will most likely be surpassed in 2017 (U.S. Energy Information Administration) (see Figure 5). The utility of bioethanol has made it a staple in American industry: it can be used both independently as a fuel source or added to gasoline as an additive. This system should raise little to no opposition, as it is building off of traditional means of bioethanol production to make it cheaper and more efficient. Figure 5. 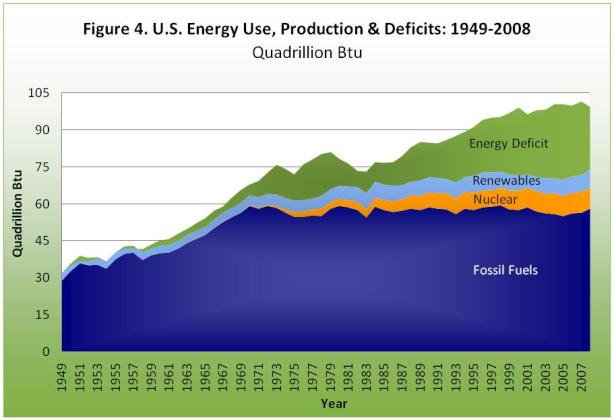 U.S. energy use, production, and deficits from 1949-2008 (Renewable, nuclear, fossil energy). Currently, synthetic ethanol is half the price of biologically fixated ethanol due to the strenuous work involved in creating it. This efficient, low-maintenance system in yeast will allow the price of bioethanol to drop. A variety of reactant vegetables may be used, including potatoes and corn. Whether the starch needs to be separated from the material, however, is unknown. The effect of yeast on the other reactants is also unknown. Additionally, maltose must be transported into the yeast cell for fermentation to take place. Transport proteins for this exist in the yeast genome, but the method and rate of maltose collection is unknown. The entire system must be tested in order to properly identify inefficiencies within the design. Subsequent modifications would ideally result in a system of peak effectiveness. Moving forward, this system will hopefully be created and tested in order to asses its performance. The plasmids must be transformed into the yeast to properly evaluate this. We will use the Gietz and Schiestl protocol for high-efficiency yeast transformation using the LiAc/SS carrier DNA/PEG method. From there, we will test for the presence of maltose, which was created in the first step. We will use phenol red to detect a pH change in yeast when given starch—indicative of maltose creation. Then we will test for glucose degradation, the second step, using glucose detector strips similar to those used for diabetes testing. Using a number of detectors that would test different ranges of concentrations of glucose would be beneficial. We would be able to accurately zero in and pinpoint the glucose concentration of a substance that may range from low to very high concentration. Testers range from 0.1-2% to 40-45% concentration detectivity. 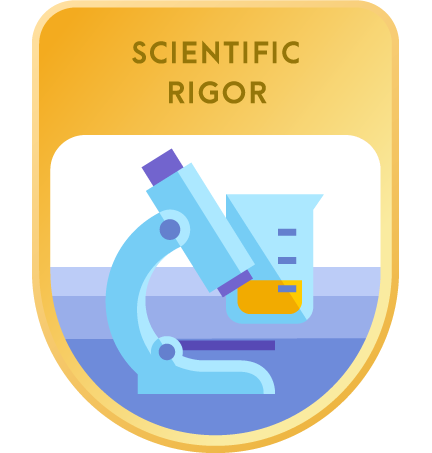 Not only will we ensure that the plasmids were successfully translated into a large number of yeast cells, but we will also measure subsequent enzyme activity. Streamlining each step of the process is top priority; this will require rigorous testing, but should result in a system of optimum efficiency. We’d like to thank Dr. Miller and Ms. Armstrong for helping with every part of the project. You helped the team tremendously in researching, writing and contacting individuals who also played an important role. We’re also grateful to Dr. Chen for being an invaluable source of knowledge. Your mentorship and support was crucial to the planning and researching portions of the project. de Oliveira DE, Arrese M, Kidane G, Panek A, Mattoon J. Trehalose and maltose metabolism in yeast transformed by a MAL4 regulatory gene cloned from a constitutive donor strain. Curr Genet. 1986;11(2):97-106. doi:10.1007/BF00378200. Ekino K, Hayashi H, Moriyama M, Matsuda M, Goto M, Yoshino S, Furukawa K. Engineering of polyploid Saccharomyces cerevisiae for secretion of large amounts of fungal glucoamylase. Appl Environ Microbiol [Internet—PMC]. 2002 [cited 2017 Apr 18];68(11): 5693–5697. Park SH, Cha J, Lee CS. Effects of bioethanol-blended diesel fuel on combustion and emission reduction characteristics in a direct-injection diesel engine with exhaust gas recirculation (EGR). Energy Fuels. 2010;24(7):3872-3883.